Valley Cemetery lies south of Vis-en-Artois, some 12 kilometres south-east of Arras on the D939 road. From Vis-en-Artois take the D9 towards Cherisy for 1.5 kilometres, then take a track towards the cemetery on your left. The cemetery was begun on 31 August 1918 with the burial of 31 officers and men of the 3rd Canadian Infantry Battalion, who had died the previous day in the capture of Orix Trench, in the big grave in Row A, now numbered 8-11. Ten further burials were made in Row A during the early part of September and in 1924-25, Rows B and C were added when graves were brought in from the battlefields and from Thilloy German Cemetery (this was about 900 metres North of Ligny-Thilloy village, close to the Albert-Bapaume road. It was a Dressing Station cemetery, which contained the graves of four Australian soldiers, three from the United Kingdom, and about 300 Germans). Valley Cemetery now contains 69 burials and commemorations of the First World War. 19 of the burials are unidentified and there is a special memorial to one casualty buried in Thilloy German Cemetery, whose grave could not be found on concentration. 30th August 1918, aged 18. Son of William and Ellen Barrett, of 38, Bastedo Avenue, Toronto. Native of Peterborough, England. 29th July 1916, aged 22. Son of Frank and Grace Ainslie Bolton, of Broadwater, New South Wales. 30th August 1918, aged 23. 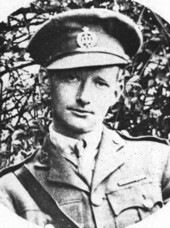 15th August 1916, aged 23. Son of Joseph and Annie Blanche Jackson, of Ellalong Rd., Neutral Bay, New South Wales. Native of Glebe, New South Wales. A heavily embellished studio portrait of 1766 Sergeant Harry Melville Jackson, 13th Battalion, of Petersham, NSW. 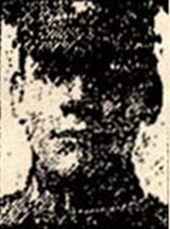 A builder's clerk prior to enlistment, he embarked with the 4th Reinforcements on HMAT Shropshire (A9) on 17 March 1915. He died of wounds whilst a prisoner of the Germans on 15 August 1916. The central image has been painted around with blue drapery and a yellow frame. A figurative wreath lies underneath the image. 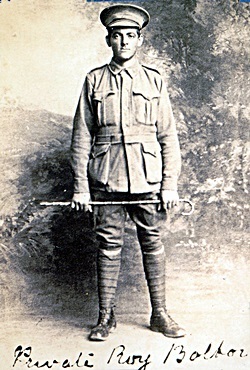 His mother states on his Roll of Honour circular that he had previous military experience at the Royal Australian Garrison Artillery at Fort Scratchley, but he had served under the name of Ernest Mayhew.